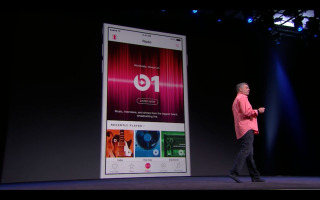 Apple unveiled a brand-new music streaming service today at WWDC 2015. Called Apple Music, the service will supplement iTunes with on-demand music streaming, a 24/7 radio station called Beats1 and a social network that will help fans connect with artists "on the deepest level, building relationships that last a lifetime." The service will be released on June 30, alongside Apple iOS 8.4, and will cost $9.99 (about £6.50, AU$13) per month or $14.99 (around £10, AU$20) for families of up to six. PC and Mac will receive a new version of iTunes around the same time, and an Android version will be made available in the fall. Senior Vice President of Internet Software and Services Eddy Cue took the audience through a live demo of the service that promises to integrate on-demand streaming from services like Rdio and Spotify with social media services like the revamped Myspace. In Cue's demo, he showed a behind-the-scenes video of Bastille composing music for their new album, as well as Alabama Shakes's lead singer and guitarist Brittany Howard in the recording studio. The new service will improve recommendations by using not just the run-of-the-mill sorting algorithms, but will use human curators to provide suggestions for what to listen to next. Its killer app, however, will be Beats1, an online radio station that will offer news, interviews and hit music to listeners worldwide. Announced hosts include Zane Lowe, Blame Ebro and Julie Adenuga. Apple Music is the product of the Cupertino's acquisition of Beats. It looks like it takes and improves upon the recommendation algorithm Beats's streaming service used, and takes cues from other services like Spotify to make music available for offline listening. The biggest problem the service will face is its price tag. While many services offer on-demand streaming for free, Apple Music has an uphill battle convincing users it will be worth the money. To soften the blow, Apple has announced that it will offer a three-month free trial for new users. Whether it turns out to be as revolutionary as iTunes was when it launched all those years ago, or flops like Ping, the social network the firm released and killed off a few years back, remains to be seen. Follow our WWDC 2015 live blog!